Since the Jury Street Court House in the centre of Warwick was reopened in 2014 following a major refurbishment, the Unlocking Warwick volunteers have staged a grand Ball just before Christmas each year. The 2019 Ball will be held on Saturday 7th December. 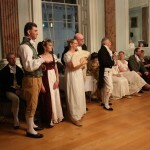 The restored ballroom with its new oak floor is the perfect setting, and guests usually dress in costumes representative of the 18th and 19th centuries when balls were held regularly in the Court House. 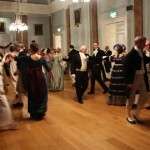 Although we describe ours as a Regency Ball, in fact the dances are typical of the Playford style, rather than the quadrilles and cotillions that are more accurately termed “Regency”. In terms of costume, though, we recommend the simpler Regency styles that are seen in films of Jane Austen novels. Each year we engage an experienced caller who can guide people through the dances, so a sense of timing and the ability to follow the instructions is more important than previous experience of Playford dance, per se. HOWEVER, in order to follow the instructions, you will need to be familiar with the terminology of traditional dance. For those unsure what to expect or what to wear, we have prepared some useful notes: Dance notes 2019 For those with little knowledge of Playford dance, this website can help you get to grips with the terms that the caller will be using in the instructions for the dances. Dressing in period costume is not a requirement, but is encouraged – dressing the part can help guests to achieve the elegance of a Darcy or an Elizabeth Bennett. During the course of the evening, we expect to perform around a dozen dances. 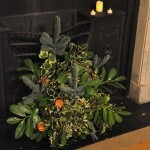 To enable as many as will to participate in each dance, the total number of tickets available is limited to sixty four. Tickets for the 2019 Ball, priced £25, will go on sale in June. As the Ball has become increasingly popular, it is likely to be a sell-out (in 2018 all 64 tickets were reserved within 24 hours of the notice of their availability). On arrival at the Ball, guests are offered a welcome drink and the bar is open all evening serving prosecco, wines, beer and soft drinks. There’s also plenty of water available – Regency dancing can be more energetic than it looks. During the interval, canapés will be served and the Unlocking Warwick volunteers usually provide a brief entertainment, such as a recreation of a scene from a Jane Austen novel, or an extract from a Richard Sheridan play. For the 2019 Ball, the dance director will be Frances Richardson and music will be provided once again by Mr Sayer’s Players.